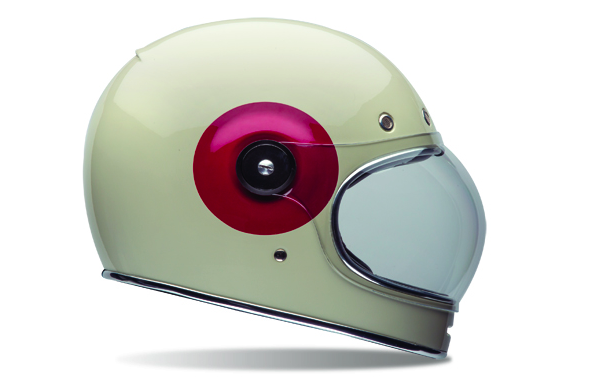 A quick surprise, as it's still 6 months out, Bell Helmets launched the new throwback inspired Bell Bullitt Helmet today. Going all hipster / Steve McQueen , it's refreshing to see them almost over invest in a premium take on yesteryear. No immediate compromises apparent. Fiberglass, with an intermediate oval fit and precise finish, the lid will be polarizing to most, but surely resonate with a specific rider palate - much like the Bell Rogue did. We've seen Bell take more and more chances as they continue to refine art by way of moto, which seems to please their audience. It pleases us. Consider me pleased. Seriously. Other notable nuggets on the Bell Bullitt include premium leather features and trim, 5 vents, 3 shell sizes and enough vintage penache to bag your mom at the Catalina wine mixer next Tuesday.